Yingluck Shinawatra, Prime-minister of Thailand, is now 10 months in power and is very popular, especially amongst Thai women. Although 44 year old* Yingluck doesn’t seem to be as wise and determined as 66 year old Nobel laureate and member of Myanmar parliament Aung San Suu Kyi, she does know how to charm people. So far she has managed to avoid too much negative press**. During the floods last year she hit the Thai front-pages with tears in her eyes. For many Thai women she has become a kind of role model, regardless of what she has to say, let alone to really worry about the results of her policy. 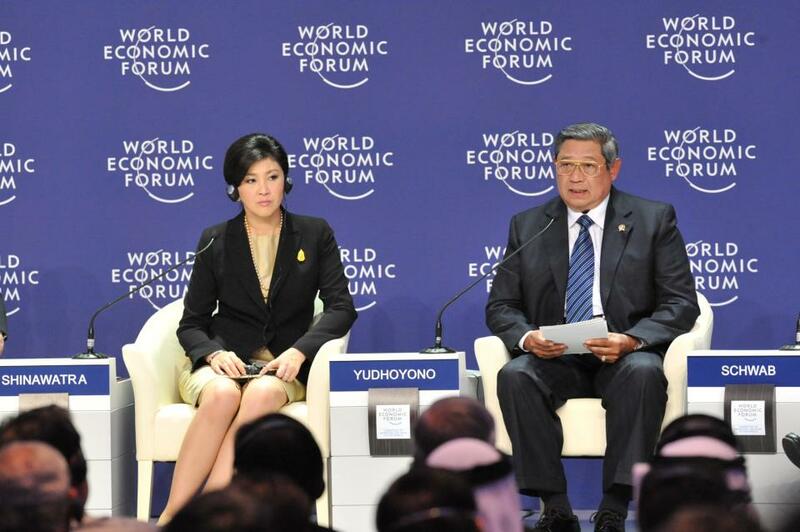 Yingluck’s at the World Economic Forum. In fact Yingluck represents everything many Thai women want: beauty, money and glory. Yinluck’s hairstyle and fashion is being copied, even by people who despise her party. Her FB photo album shows thousands of pictures. Her ‘marketing strategy’ seems to be working and arguably she’s the prettiest PM ever. Aung San Suu Kyi’s Facebook page currently lists 477,706 fans. The statististics show that recently her FB popularity has been surpassed by Yingluck who now has 599,020 fans on Facebook. In the contrast to Aung San the numbers are rising rapidly. Aung San’s Facebook is being maintained by Burma Campaign UK, who assure the account will be handed over to her soon. In a recent statement however Aung Sun said she was too busy for Facebook and questioned it’s future value as technology progresses. The majority of Aung Sun FB fans are foreign residents, since only 0.8 percent of the population has access to internet, compared to 21.2 percent in Thailand. Myanmar’s population is estimated to be 48 million, however millions of citizens are unregistered. Thailand’s population is over 68 million. 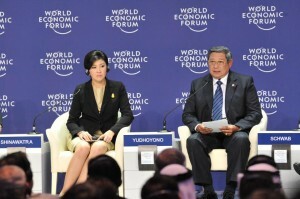 Yingluck becomes 45 on the 21st of June 2012, Aung Sun becomes 67 on the 19th of June. Opponents as well as part of the older (male) voters prefer to insist that Yingluck is a proxy of her brother, ousted ex-PM Thaksin. In the country there’s a division of hope and fear that she will pass an amnesty bill for royal approval, which may lead to revolt from the opposition and possibly result in a new military coup. Although the political pressure to act is building up, Yingluck has so far reluctantly attempted to treat the matter impartial. Part of her electorate wants Thaksin back, which was a kind of promise to get her elected in the first place, however this would certainly not be beneficial for her role as PM and worse; the stability of Thailand. Currently Aung San Suu Kyi seems to have been put in a highly onflicting situation as well. For both women it seems like checkmate. I wonder how they manage their way out.